African Gothic’s title provides a perfect summary: the languid decay of a strict culture, maudlin fears of madness and magic, and inevitable grisliness all place the gothic firmly into the rural wastelands of apartheid-era South Africa. 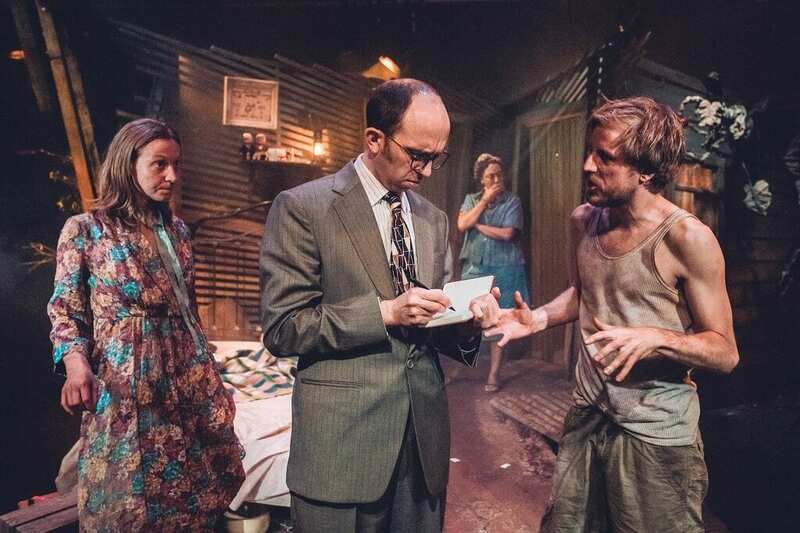 Written in 1986 by Riza de Wet, this British production from Two Sheds Theatre (also responsible for Trafalgar Studio’s acclaimed 2015 run of My Children! My Africa!) is a tight, slow-burning affair. 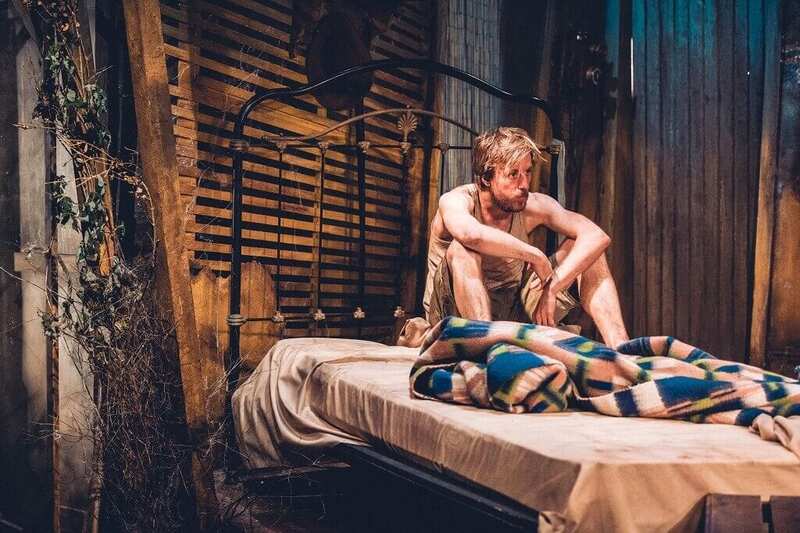 The events take place on an arid family farm, in the dilapidated bedroom of white siblings Frikkie (Oliver Gomm) and Sussie (Janna Fox). 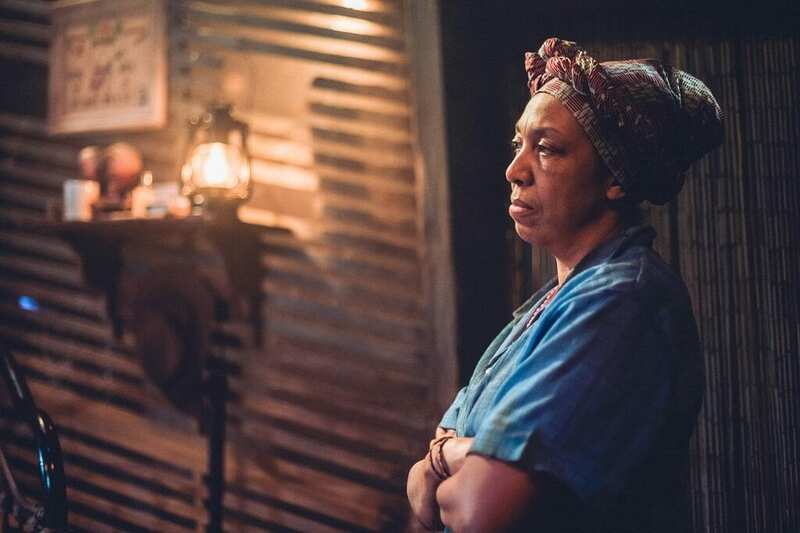 Their crops are dry, their strict religious parents died some time ago and they live a capricious, nocturnal life with their reticent black maid, cook and carer Alina (Lesley Ewen). Though they are adults, they struggle with reality and regress constantly, paralysed in states of unsettling play and grotesque shame, always about some moral moment from their past. This was a little hard to stomach at first, but you quickly become engrossed in their larger than life fantasies, and their personal intricacies. 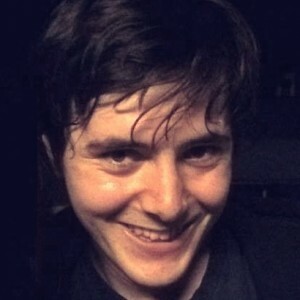 Grové (Adam Ewan) is a lawyer who drives up attempting to discuss distant family matters, and becomes an unwilling houseguest. He asks all the questions the audience would expect a too-sensible urban man to ask of this feral pair, and gets pulled into their desperate manic-depressive life. Performances are uniformly strong and well realised, with Fox particularly playing the wild-eyed Sussie to moody excess. She leaps, giggles and weeps her way through the show, keeping the momentum throughout. Ewen’s Alina is a diametric opposite, measured, unfazed and watchful. Some of the most unsettling moments don’t come from the sibling’s abusive games, but from Alina passively watching them, sometimes smiling, always still and contemplative, just peeking through a bead curtain. Throughout the show, the siblings show a suicidal dedication to the land despite the haunting memories and empty life it bears for them, but why has Alina stayed? She could just be a good mother figure, but the shows twisted examination of human relations gives me the sense that Alina is – kindly – waiting for them to die. As the only representative of Black South Africa, whose masters proclaim the land is theirs to do with as they like, her much deeper roots in the land that has withered under their care may explain why she has stayed on with these waifs, though she does display almost baffling support and affection for the pair. It makes you wonder if, due to the tumultuous history of South Africa that the siblings enshrine, she just sees their behaviour as a variation of that of the vicious, repressed colonisers, and not really different to how their ancestors behaved. Alina has around ten lines of dialogue, but her almost constant presence is wonderfully integrated and gets under your skin. The script pushes the historical relation, the siblings regularly harking back to how Mummy and Daddy would have it, and living in fear of their own inadequacy. Their paralysing gothic madness feels linked to the earth and dust that blows into their house, erasing the European intrusion. But beyond showing the land does not belong to Dutch settlers, I struggle to find any other fully formed intentions in this non-naturalistic play. There are plenty of allegories, from their self-made Garden of Eden, to the significance of the moon, to the power of water, but no solid conceptual intention. These are textual problems however, and the production itself is very strong. There’s never a dull moment, a rarity in shows whose characters are intentionally grating and disruptive. This is a real testament to the directors’ pacing of the piece and the quality of the performances. The design is also tight and beautifully executed, although a gnarled tree bearing a single apple with a solitary crow hovering over it may force the Eden allegory a little too strongly for some. It still is a striking dilapidated set, a slowly decaying shack that its alternately frantic and muted inhabitants can contain themselves in. The irregular room blends well with earthy lighting and haunting rusty metal soundscapes. The production as a whole is an entertaining, morbid experience. 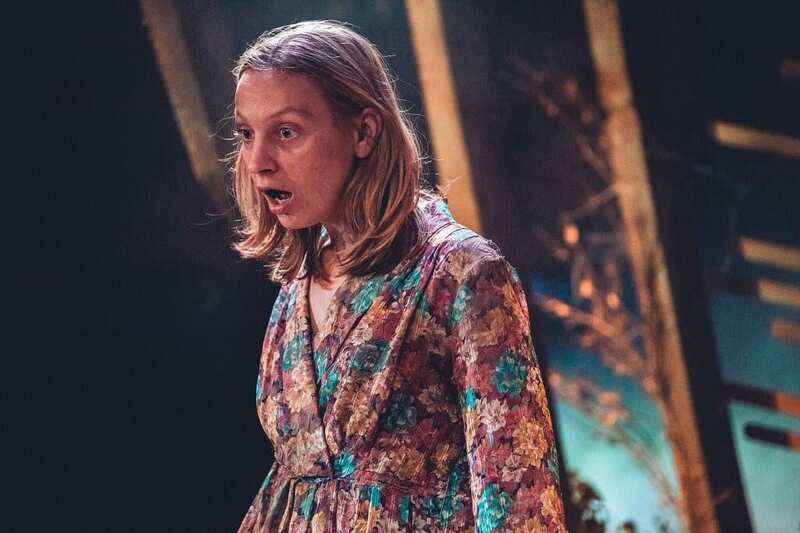 Two Sheds Theatre put on a very good performance of a competent play, and their dusty, gibbering depiction of denial and guilt is well worth a visit to the cosy Park Theatre for.